Quite a contrast to yesterday: we transited nearly the full length of the Basin Grazing Area, and the wind was howling again, out of the west. 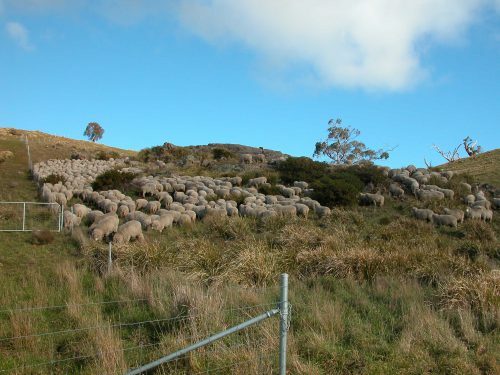 Yesterday, late in the day, the wind veered northerly long enough to draw the flock out of the Back Gully Reserve and into the Grass Gully, where we picked them up this morning. The Basin GA is still really wet in parts, and I made a number of poor calls today on the route--ended up walking on water a fair bit. I'm nearly as touchy as the sheep about it, since my boots leak. So we were all hopping from tussock to tussock, trying to keep our feet dry. In my defence, the longest walk-on-water stretch did not look wet from a distance! The other contrast with yesterday is we were heading downwind, so it was more of a battle to keep them aimed where I wanted them to go. We pretty much stalled on the steep hill above Old Cabin, and the dogs and I were all puffed by the time we finally got them down the hill. Lunch was in the lea of the log the sheep love to climb on in Old Cabin. I could easily have had a nap, except the sheep were rather determined to work back into the wind toward us, so lunch break got cut short. When we got to the bottom of Waterfall Gully, they were most enthusiastic about heading in: they have clearly learned about the attractions of this steep native reserve. They quite happily headed up the south side--the north-facing slope--which was probably the driest underfoot they had all day. When I ran the dogs a while later, the sheep were grazing all across the slope in the afternoon sunshine. Makes my heart glad to see them enjoying themselves! p.s. I did walk the whole track today--mostly because I'd have had to backtrack up Waterfall Gully to get the Polaris. I did at least wear my ankle brace, which helped a lot. P1: Pickup. The hill with trees is in the Back Gully Reserve (we’re facing west). You can see there is still a lot of bare ground, something I expect to disappear as spring makes itself felt. P2: The spring in Little Quarry Tree Reserve, and some of the baby trees. Table Mountain is in the background. The frogs were going wild! P4: The Gang of Four leading the flock: left to right, Elf, Felix, Vicki and Clara. I just love this photo. I suppose the more accurate statement is: The flock following The Gang Of Four following me! P5: Heading into the swamp. See? It does NOT look like a swamp from here, does it?? P6: But this is a sample of what it was like all the way around that corner! P7: After lunch break (and a short rest/ruminate for the flock), heading north through Old Cabin toward Waterfall Gully.